Walking Trails | Business & Tourism Creswick Inc. There are a number of walks in and around Creswick for all abilities. Please call into the Visitor Information Centre at 43 Albert Street (Midland Highway), to pick up walking trail brochures, or click on the links on this page to download PDF copies where available. If you would like to join a friendly local walking group, for an hour's easy walk, followed by coffee in one of Creswick's great cafes, the Creswick Walking Group meets on Tuesdays and Thursdays at 8.30am at Albert Studio, corner Albert Street (Midland Highway) and South Street. All welcome, rain, hail or shine! 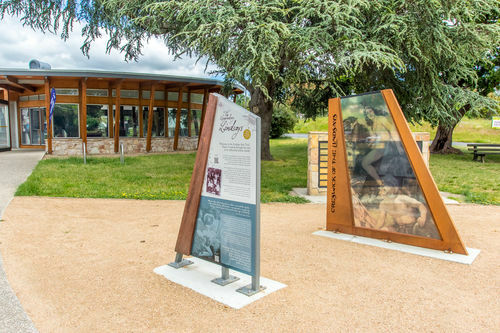 This self-guided walk celebrates this famous and fascinating family who lived in Creswick from the late 1890s to mid 1960s. A Trail brochure is available from the Visitor Information Centre, or click here to download a PDF copy. Most of the Trail is easily accessed by foot within the Township. 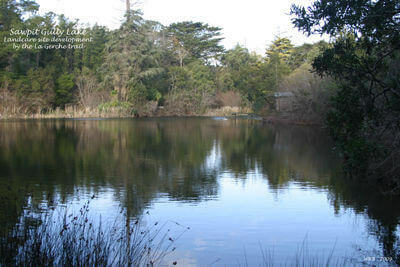 There is a pleasant walking track around the lake in Calembeen Park, accessed from Cushing Avenue (beside the caravan park). 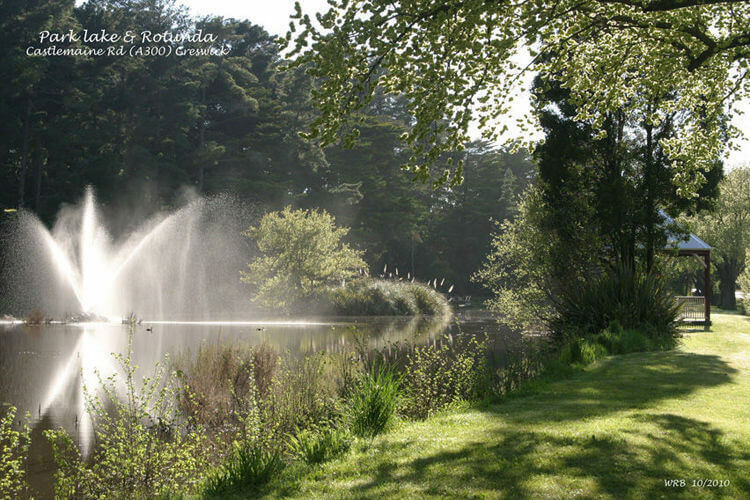 The lake abounds with native birdlife and plants, including fabulous waterlilies from late spring into summer. This undulating walk has one slightly steep section. This walk runs beside the Creswick Creek. It is a flat gravel path, easily accessible and suitable for all ages. The track is accessed from Water Street just before the bridge over the creek. Follow the track to the right until you reach Melbourne Road, where you can retrace your steps back to town, or turn right onto Melbourne Road and loop back into town. This trail around the township showcases Creswick's heritage buildings. The trail is 8.5km long and is part of the Goldfields Track. A booklet and map is available from the Visitor Information Centre, or visit the Great Dividing Trail or Goldfields Track websites. 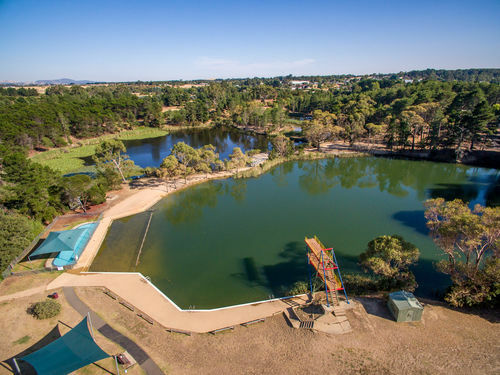 This is a beautiful lake with two island features, a fountain, and a recently constructed rotunda, located on Castlemaine Road (Midland Highway). A walk around this lake can easily be extended by walking up the path towards the tennis courts and taking the track to the right to loop around the newly planted native plantation and the tennis courts. Why not take the time to explore the forest around Creswick by venturing out on some of these suggested easy walks. Maps and brochures are available at the Visitor Information Centre. A 2.2km self-guided walk through the nursery plantations surrounding the old Creswick Landcare Centre/Nursery and La Gerche's original plantings. These trees are now over one hundred years old and tower over the landscape. They were planted by Creswick's first forest bailiff - John La Gerche. Storyboards along the trail highlight the impacts of mining on the forest and La Gerche's efforts to rehabilitate the land. La Gerche experimented with a diverse range of conifers and deciduous trees from the Northern Hemisphere as well as some Australian natives. The variety of tree species is both fascinating and picturesque. The 2km Landcare Trail is an easy self-guided trail passing over wetlands, through plantations and grasslands, and provides an introduction to general landcare issues including water quality, salinity, revegetation, weeds, conservation, biodiversity and farm forestry. A beautiful mayfly sculpture by Smeaton artist Bronwyn Snow is a recent addition to the walk. Keep a look out for echidna and kangaroo tracks, and scratch marks on blue gums from local sugar gliders. 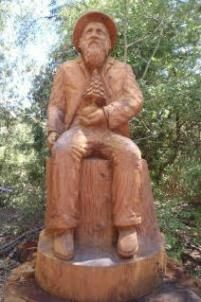 Adjacent to both tracks is a chainsaw carving of John La Gerche, carved from a fallen Californian Redwood that was originally planted by him. 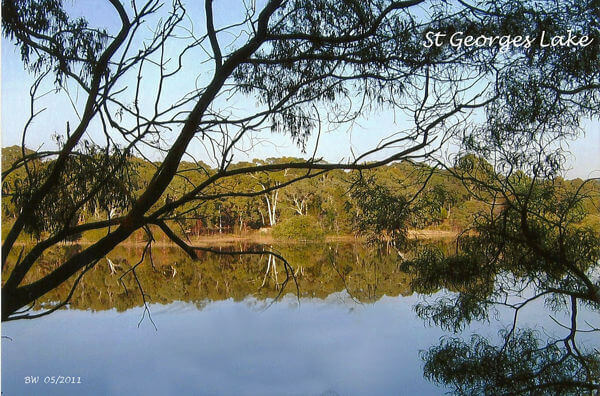 This gently undulating track around the shore of St George's Lake is a great place to watch water birds and maybe even catch a glimpse of the elusive platypus. This is a picturesque walk. A reasonable level of fitness is required for the whole walk. However, there are wheelchair accessible ramps to both the picnic area and a viewing platform further around the Lake. 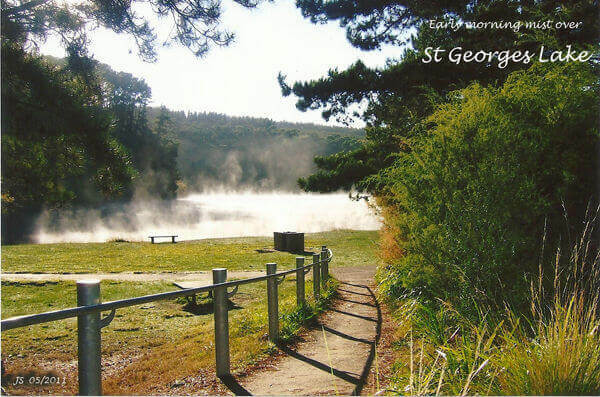 St Georges Lake is also a great place to start if you decide to venture on to one of the longer walks in the park. 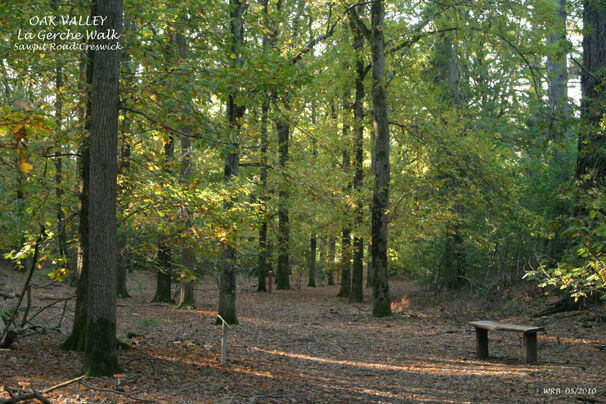 These longer walks are just a few suggestions to help you explore and enjoy Creswick Regional Park. Remember to wear strong shoes and appropriate clothing. Always let someone know before you go. Time: One hour 45 minutes return. Walk to the concrete ford on the eastern side of St George's Lake. Follow the track along the water race and through the gate into the Koala Park. Walk through the park and exit on the other side continuing along the water race across Jackass Road to the picnic area at Eaton's Dam. A relic from the gold mining era, Eaton's Dam is an interesting example of early stone and earth construction techniques. 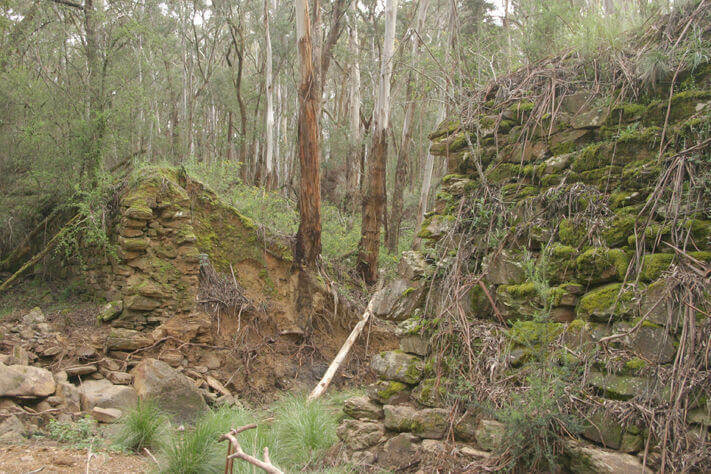 In the early 1930's the dam wall breached (as shown) and the proceeding rush of escaping water seriously flooded the township of Creswick. The Koala Park was established in 1941 and many koalas were housed here. Unfortunately, most of the koalas have migrated, and it is a rarity to see any these days. However, it is a delightful walk amongst the native scrub of the Creswick forest. Time: Four to five hours to Ballarat. 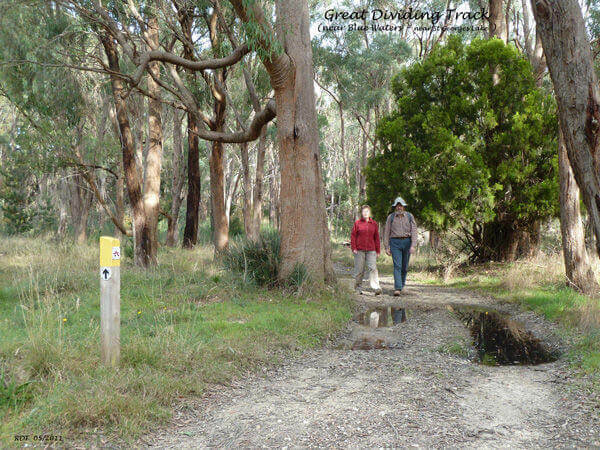 The Great DividingTrail is a community-planned 260km public walking trail following the top of the Great Dividing Range from Bacchus Marsh to Bendigo. The local section of the Great Dividing Trail from Creswick to Ballarat is called The Miner's Walk, and takes you on an historical journey through Creswick Regional Park to Ballarat along the same path miners walked a century ago. Follow water races and trails marked by quartz stones, the same stones that the miners used to guide their journeys when travelling at night. For more information on the Great Dividing Trail, click here to visit the website. Click here to download a PDF copy of the Hepburn Shire Council's Walking & Cycling Guide. 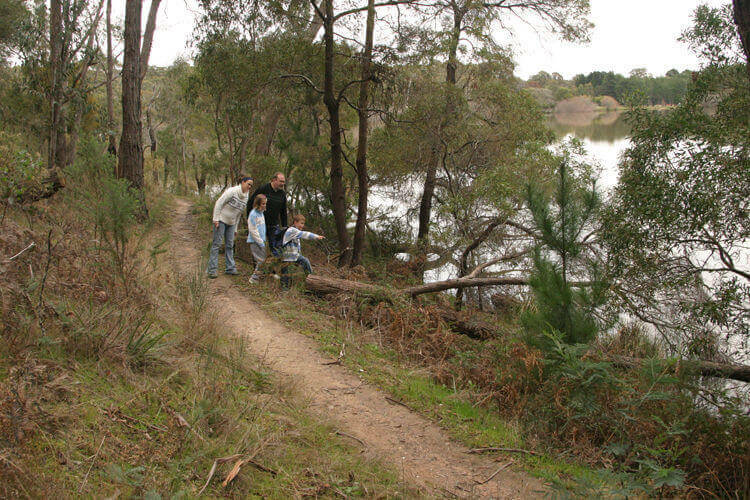 Click here to download a copy of the Parks Vic Creswick Regional Park Notes, which includes a map of bushwalking trails in the Park.